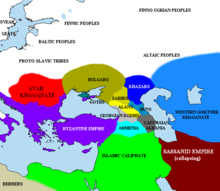 A recent genetic study states that the ancient Avar ruling-class individuals were of predominantly East-Central Asian origin. This research suggests that the Avars might have been a federation of different tribes, however the paternal genetic data of the Avar elite is quite homogeneous and implies South Siberian genetic origin. The maternal lineages of the elite are more diverse than the paternal and show about 70 percent of Eastern Eurasian origin. The available data point to the conclusion that the Avar elite originated from the Rouran Khaganate. Havlík, Lubomír E. (2004). 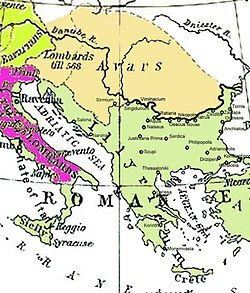 "Great Moravia between the Franconians, Byzantium and Rome". In Champion, T. C. Centre and Periphery: Comparative Studies in Archaeology. Routledge. pp. 227–237. ISBN 0-415-12253-8. Kyzlasov, L. R. (1 January 1996). "Northern Nomads". In Litvinsky, B. A. 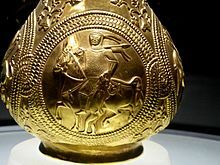 History of Civilizations of Central Asia: The crossroads of civilizations, A.D. 250 to 750. UNESCO. pp. 315–325. ISBN 978-9231032110. Retrieved 29 May 2015. Ekaterina Nechaeva (2011). 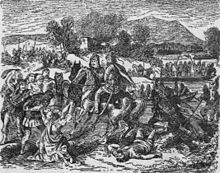 "The "Runaway" Avars and Late Antique Diplomacy". In Ralph W. Mathisen, Danuta Shanzer. Romans, Barbarians, and the Transformation of the Roman World: Cultural Interaction and the Creation of Identity in Late Antiquity. Ashgate. Pohl (1998). "Conceptions of Ethnicity in Early Medieval Studies". In Rosenwein. Debating the Middle Ages: Issues and Readings. Blackwell. ISBN 9781577180081.